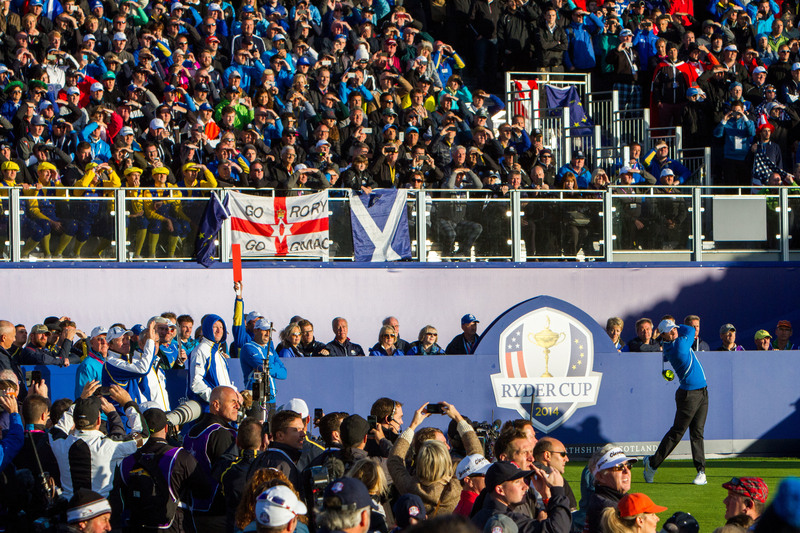 The Ryder Cup in Gleneagles helped boost spending figures. Tourism spending in Scotland has risen to its highest level in more than a decade despite a drop in visitor numbers in the last year. Tourists from Great Britain and overseas spent £4,974 million in 2015, up £257 million on the previous year, according to Visit Scotland figures. Nearly 15 million tourists visited Scotland in 2015, down 4% from 2014, but spending has continued to rise, suggesting Scotland saw fewer tourists who spent more money. Domestic tourist spending has risen by £400 million (14%) to £3,279 million, more than offsetting a £150 million drop (-8.2%) in international tourist receipts to £1,695 million. VisitScotland put the year-on-year slump in visitors down to the hangover from the bumper attractions of the Commonwealth Games, the Year of Homecoming and the Ryder Cup in 2014. Edinburgh and Glasgow rank in the top five for visits outside London and the majority of overseas visitors and expenditure come from Europe. Tourism Secretary Fiona Hyslop said: “Our tourism sector is of vital importance to the Scottish economy, employing 196,000 people across the country. “A second programme of themed years is under way, which this year will focus on innovation, architecture and design followed by history, heritage and archaeology in 2017 and young people in 2018. VisitScotland chief executive Malcolm Roughead said: “We have recorded our highest combined visitor spend since 2005, showing that interest in the country continues to fuel increased economic growth and jobs for Scotland. “A 5% increase in overall tourism expenditure in 2015, including a 14% jump in domestic spend, is a stunning success for Scottish tourism. “Despite a slight dip in international visitors in 2015 our spend figures remain strong and Scottish tourism continues to create jobs and sustain communities in every corner of Scotland – putting it at the heart of the Scottish economy. “2014 was an incredible year for Scottish tourism with high impact events including the Commonwealth Games, the Year of Homecoming and the Ryder Cup raising Scotland’s profile to new levels.